- Quick and easy drying. 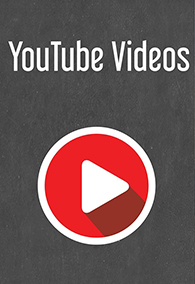 - Adds lubrication to reduce scratches and swirls. - Adds shine and gloss. - Use after washing your car. 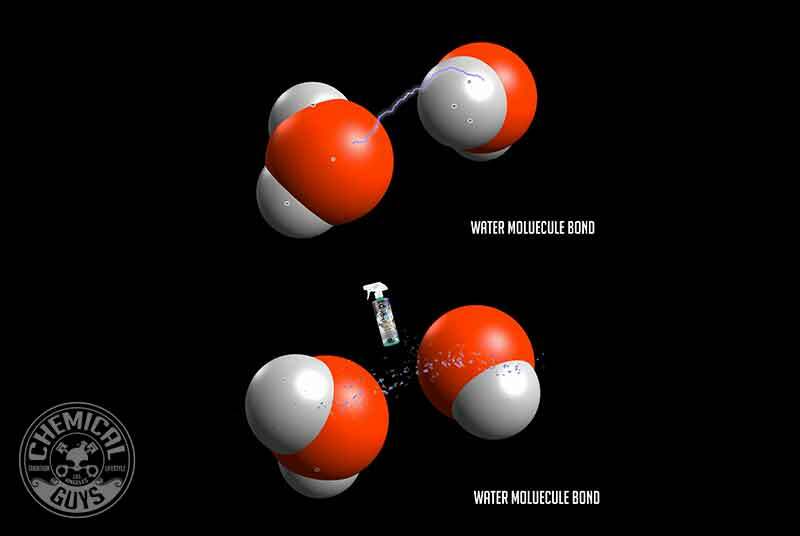 Chemical Guys After Wash is an advanced paintwork moisturizer that aids the drying process. The innovative drying aid repels water, adds lubrication, and creates a streak-free shine when drying any vehicle. 95% of swirls and scratches come from poor wash and dry habits. The advanced lubricating polymers in After Wash glide any premium microfiber towel over paintwork for a scratch-free shine. It’s the safest way to dry any vehicle. Use After Wash on any car, truck, motorcycle, RV, boat, motocross, off road, ATV, or snow vehicle for perfect streak and scratch-free drying! 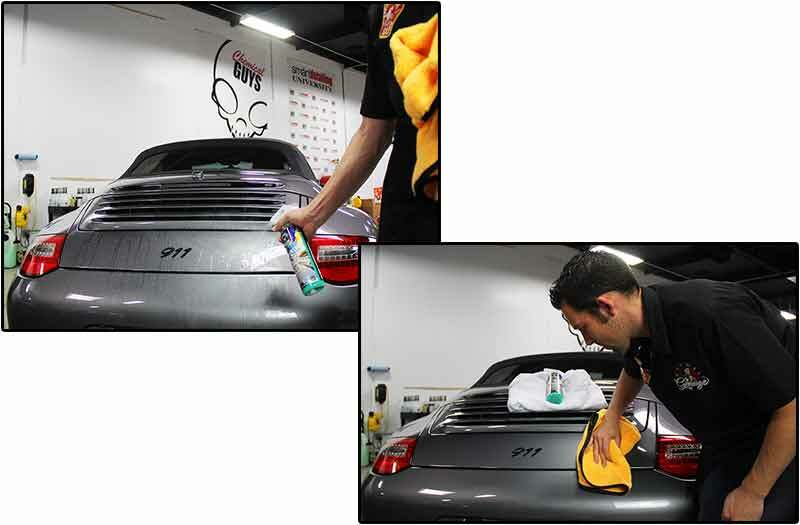 Hydrophobic drying aids repel water to quickly dry paintwork with a premium microfiber towel. After Wash enhances any wax or sealant coat for improved longevity with a high-gloss shine. Use After Wash to dry paint, wheels, glass, metal, and plastic surfaces. Simply spray After Wash on the wet surface, then watch the puddles of water sheet off the paint. Buff off remaining water with a premium microfiber towel. After Wash repels water from the surface for a smooth finish after a wash. Chemical Guys After Wash makes drying your vehicle quick, easy, and safe. 95% of swirls and scratches are caused by poor washing and drying habits, and equipment. Good drying tools and techniques are critical to maintaining scratch-free paintwork. After Wash provides extra lubrication between the microfiber towel and paintwork for scratch-free drying. The innovative formula helps the microfiber towel absorb more water for a streak-free shine in less time. 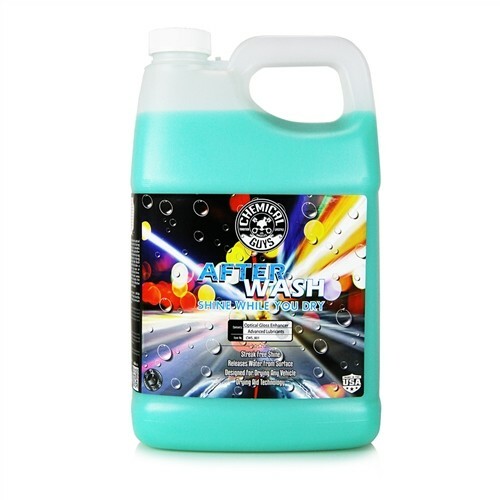 After Wash enhances any wax or sealant coat with synthetic polymers for a brilliant shine after a wash.
After Wash uses hydrophobic technology to push water away from paint and quickly dry any vehicle. Simply spray After Wash on wet paintwork after a wash. Using a premium microfiber towel, gently dry the surface to achieve a streak-free shine. The secret to After Wash is the advanced lubrication agents that reduce friction between the paintwork and microfiber drying towel. After Wash dries faster than a towel alone while reducing the chances of scratching paint. 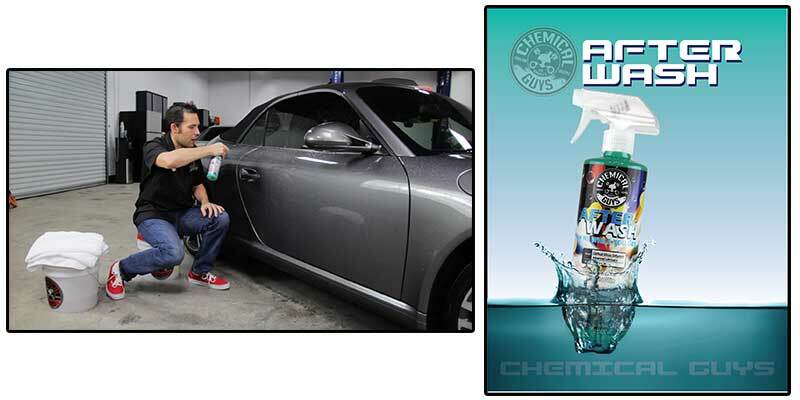 Chemical Guys After Wash makes drying any vehicle faster and easier than ever imagined.